The absolutism of a principle is directly proportional to the irreducibility of its context. Here’s an absolute principle: all principles are situational. This kind of conundrum gives people headaches. Conservatives despise “moral relativism” for that reason. They can’t deal with the internal contradiction. It’s anxiety-provoking. The universe itself, the Grand Context, is this same conundrum. The Big Bang implies that the universe has a physical and a temporal boundary. What’s outside it? What existed before? It’s impossible to say. So we posit God, He who exists outside the knowable. To Aristotle, the orbiting stars and planets were a set of nested spheres set in motion by the Prime Mover. Medieval Christians equated the Prime Mover to God. For them, there was one system, one environment, one context, divinely ordained, and the goal of humanity was to live in harmony with the music of the spheres. We’ve evolved a world view that’s pretty much the inverse, and it’s keeping us from seeing the climate crisis for the urgent situation it is. We no longer have divine nested spheres. We have anthropogenic nested contexts. We’ve constructed dynamic, interlocking rings of mental, social, and physical infrastructure and interposed this construct between us and the universe. This construct seems as real as nature itself, ambient and environmental, but of course it isn’t. 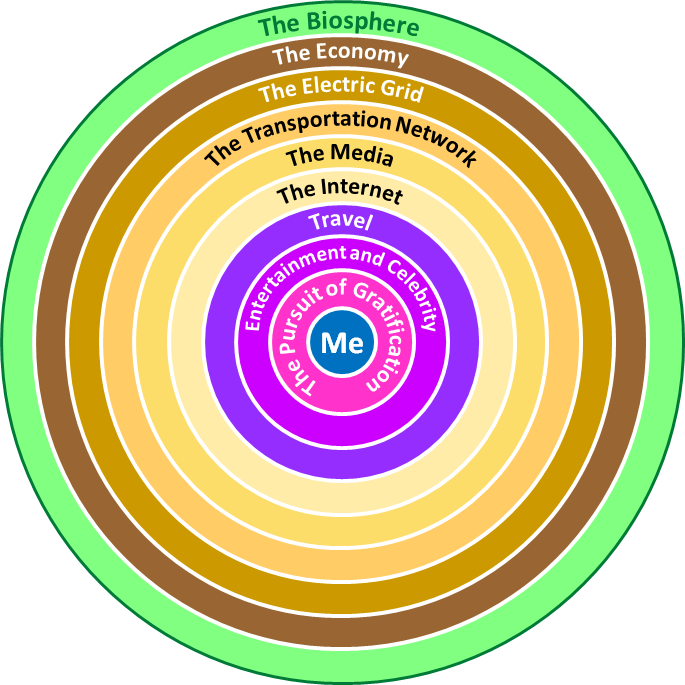 These nested spheres of context obscure the irreducible principle that we can’t alter the biosphere—the ultimate context—without consequence. The biosphere is flashing its warnings: acidifying oceans, species retreating to higher latitudes and altitudes, precessing growing seasons, rising average global temperatures, more erratic weather, an increasingly serpentine jet stream, disappearing glaciers, and shrinking Arctic ice cap. But we’re unable separate these signals from the noise of our artificial environments, which seem more normal than nature itself. It’s a failure to recognize context. It’s a cacophony of the spheres.